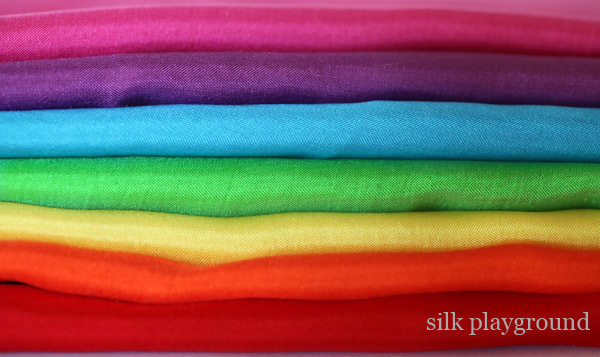 We provide playsilks: gorgeous large silk square scarves in bright rainbow colours for children to play with. We're located in Australia. What can you do with playsilks? Some parents may think that their child wouldn't enjoy a toy that isn't complex or battery operated, or that their child "isn't creative". All you need to do is show your child that playsilks can be this or that. Give them a couple of ideas (see below for inspiration). Your child's innate creativity may surprise and delight you. All Silk Playground customers will receive access to a collection of over 30 illustrated creative playsilk ideas to help you get the most out of your playsilks. Our playsilks are 90 x 90cm, 100% high quality silk, securely hemmed and dyed in bright, even, solid washfast colours. Our specialty is a set of 7, but we also sell individual playsilks. To place an order, visit our online Shop to purchase with PayPal, or pop your order onto our contact form if you prefer to pay by bank deposit. Any fabric can be fun, but silk is a tiny bit special. It has a wonderful shimmery lustre and looks and feels beautiful. It's also durable, lightweight and partially transparent. Playsilks come in a range of sizes. The small ones (11" square) are good for little babies, but will not be large enough to use as dress-up costumes when they're older. Midsize ones (20” or so) are good for toddlers, but the most versatile size is the large size (35” or so). The larger size can be folded to make them more manageable for younger children and they can be used all the way through to around age 10. Silk Playground playsilks are the larger size, 90 x 90 cm or 35” square. If the silk fabric is too heavy they won't have that beautiful flowy drape to them. Too thin and they may not be durable enough for years of play. (Playsilks can be used from newborn up to around age 10, so it pays to get ones that will last). Ours are mid-weight, durable yet flowy and a tiny bit sheer. The usual choices here are a mottled/uneven/tie dyed look or a solid and even dye job. It’s really up to personal preference. Silk Playground playsilks are dyed to be solid & even. Playsilks colours can be bright & vibrant, or in muted pastels, so it depends on what you’d prefer. Ours are in bright, rainbow colours. Our playsilks are professionally dyed with permanent, lightfast and washfast dyes. There are a range of silk dyes available. As children may put playsilks in their mouths, the dyes must be non-toxic in order to be safe. Silk Playground playsilks are dyed with non-toxic dyes. The choices are usually rolled & hand stitched hems or sewn hems. Durability is again the consideration here. Refer here for a photo that shows both types of hemming. Both should be ok under normal conditions, but I have tested both types in child care centres and sewn hems will withstand the most vigorous play. Our playsilk hems are neatly sewn. So there are few things to think about. Before you buy anywhere, I recommend that you ask about the points that matter to you. You can even dye your own playsilks, but keep in mind that dye evenness and dye permanence can be harder to achieve (depending on the dyes and dyeing methods you use). To turn a playsilk into a streamer wand, just choose one and tie it tightly onto the end of a stick or rod. Wave it around and there you have it! Playsilk streamers float beautifully in the air and shimmer in the sunshine. Once you’re finished, you can untie it and move on to the next play idea! Take a rope and tie it between two kitchen chairs to make a washing line (we used a skipping rope). Pop some shower curtain rings on the rope and your child can have fun threading playsilks through the rings. My four year old was really engaged in this activity and loved ‘hanging out the washing’. It’s great for developing manual dexterity. Once she’d done that, we decided that it would make a great rainbow theatre curtain that could be swept open and walked through. So it ended up turning into a little concert stage and we took turns appearing through the curtain and singing songs, with lots of clapping and bowing. We may well use it as a puppet show curtain later on, too. It’s very easy to assemble and pack away again. Have fun! My 4 year old can’t get enough of any sort of costume. This one is a medieval style that’s easy to assemble (and dismantle!) with no sewing required. Just take a long strip of bubble wrap about 13cm wide, and roll it a few times until it makes a firm tube. Put some sticky tape along the seam to keep it together. Then wrap this tube around your child’s head to determine how much of it you need. Leave a tiny extra allowance so it’s not too tight, then trim it off and sticky tape the ends together to make a circle. Next, take a playsilk, drape a corner into the circle and wrap the length of the playsilk round and round your tube circle. Tuck the ends in and you’re done! Pick another playsilk for the veil and pop it on your child's head. Then place the circle firmly on their head and you have an instant medieval outfit! It would also be perfect head attire for a nativity costume for either girls or boys. It’s a quick and easy way to keep a veil on, even during active play. (See the photo on the left of the princess escaping the clutches of the “dragon”). When you’ve finished with that, just take it off and unwrap the playsilk from the circle. Keep the circle in the dress-up box for next time! Today we picked out a vibrant blue playsilk, draped it around my daughter’s shoulders and she ran around the house and the back yard being a super hero. The silk is so soft and flowy and it billowed behind her. It was the perfect superhero cape! Part of motherhood that I really enjoy is unearthing all of those nursery rhymes and songs I knew as a child, but had long since forgotten about. This is another gem from Ruth, a wonderful children’s music teacher I know, who uses her set of 7 playsilks to “Sing a Rainbow” with her students. Tie each silk together in the order of the colours in the song to make a long colourful rope: red and yellow and pink and green, purple and orange and blue. Then you or your child can pull each silk out of a box as you sing along. We had some outdoor fun with a variation of this in the back yard. We formed the rainbow rope into a circle and Miss A ran around it, singing along as she passed each colour. Then she tried stepping and jumping in time around inside of the circle, where the circumference was a bit smaller. This is probably the most popular use of playsilks with my daughter at the moment. She often asks for a ‘princess dress’ which is a playsilk wrapped around under her arms and tied it at the back. You can fold it before you tie to make it the right length for your child. She also loves to see how many silks she can put on at a time. Here she is with a hat, dress, belt and robe. The robe is like a reverse ‘princess dress’. Start at the back, bring it around under her arms, but then tie the ends at the back of her neck, like a halter neck. It provides an extra bit of ‘swish’ to the outfit. What can I say, kids love colour! Peek-a-boo is not only fun, it’s a way to help babies understand that people and objects exist even when they are out of sight, also referred to as ‘object permanence’. It’s an important cognitive developmental milestone. A variation on this game might be to take a favourite small toy, cover it with a playsilk and then ask your baby to find it. If they lift up the silk and look for it, they are aware that it's there even though they can't see it. If they appear confused by the disappearance of the toy, lift up the silk and show them where it is. With a bit of repetition, they will soon understand what's going on. While every baby is different, this milestone is common from eight months onwards. So indulge in little peek-a-boo fun with your baby: it's good for them! Ask your child to sit on a step, take off their shoes and place a foot on top of the knot. Give them one playsilk in each hand and guide them through the process. The bow at the end is going to look a little funny due to it being two-toned, but they’ll get the idea. Let them practice each little step until they’ve mastered it and can move on to the next one. By using two different coloured silks, your child will be able to follow your instructions more easily (especially if they can’t always tell their right from left). As long as they can distinguish between the two colours, they’ll be able to follow along. By learning the technique on a larger scale, they can focus on the steps in the process and don’t have to concern themselves with the manual dexterity needed for much smaller, thinner laces. Once they know how it’s done and have had enough practise they can move onto trying it with shoelaces and it won’t seem nearly as daunting. The look of self satisfaction on a child’s face when they achieve this milestone is nothing short of wonderful! We recently had a day at the beach and since then, sand & sea have featured in my daughter's conversations and playtime. She's also fascinated with turtles, thanks to Lynley Dodd's wonderful book The Smallest Turtle, so we made some out of an egg carton and decorated them with crayons. My daughter likes to spread out a yellow playsilk for the sand, and a blue one for the water and makes the little turtles scitter scatter across the sand and into the sea. I'm an Australian mum who loves reverting back to childhood as I raise two young children.